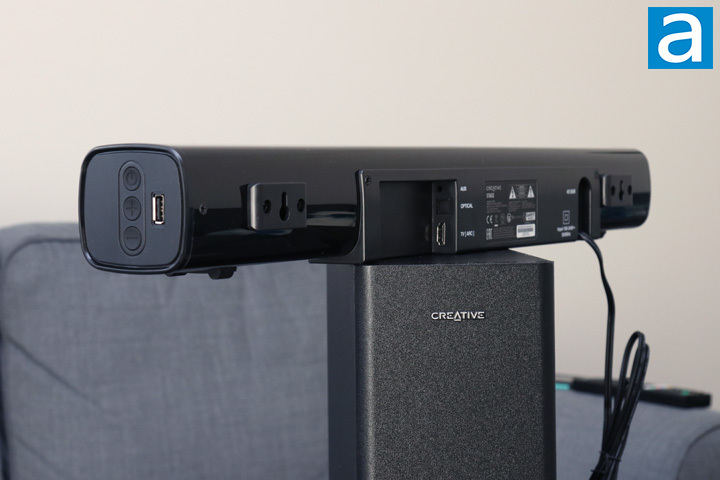 The Creative Stage is an average looking soundbar with nothing really standing out aesthetically. 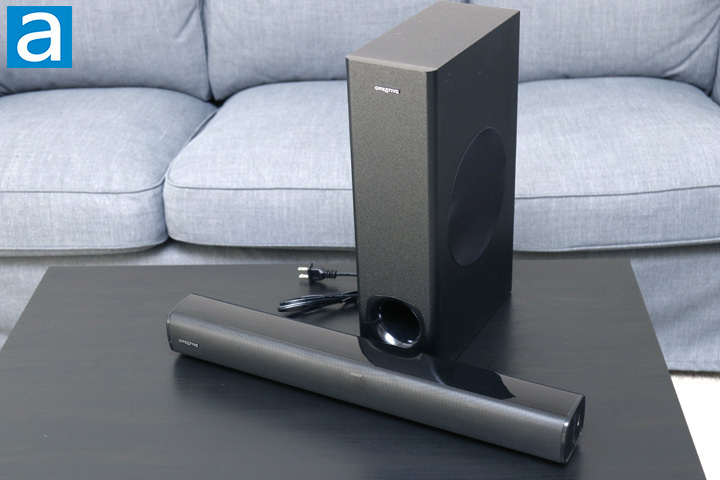 This soundbar is pretty typical with a rounded rectangular prism shape. The front shows a mesh grille all across, with a Creative logo on the left side. The top and bottom are glossy, which means we will see quite a few fingerprints or dust particles. Measuring at 550mm in width, 70mm in height, and 78mm in depth, the overall soundbar is pretty compact. Considering it is meant to sit under your monitor, this size is as I would expect. It also tips the scales at about 1.2kg or 2.64lbs. Unlike the library I mentioned in the beginning, the whole shell is made up of plastic with the exception of the metal front mesh. Glass and audio products are a bit of a rarity, so this is not much of a surprise. Otherwise, we also have some rubber at the bottom of the soundbar to reduce vibrations that could affect sound clarity. Behind the front-facing speaker grille, we have several interesting things to point out. Directly in the middle is a two character, seven-segment display to show different information such as current input, system status, or volume. To the right of the display is an infrared receiver for the remote. A pair of paper 1.3" tweeters can be found on the sound bar with one on each side. Creative claims these are custom-tuned, mid-range drivers for enhanced dialog clarity. Combined the frequency response of the whole set is at 55Hz to 20KHz. These numbers will be translated into actual performance when we evaluate these speakers later on. Signal to noise ratio is specified at ≥72dBA. As this is a 2.1 setup, the second number means a slim subwoofer is part of this package. This should help with the lower frequencies that would normally not be covered by the tweeters. This taller box has dimensions of 420mm by 115mm by 250mm and a weight of 3.07kg or 6.8lbs. The subwoofer looks similar to the one from the Creative Sound BlasterX Katana, but is clearly lighter. Inside is a single driver, though I was not able to get a better look at it. Creative does mention this is a long-throw driver. Otherwise, the entire enclosure is made out of MDF with a flared port tube. The right side of the enclosure also has a fabric mesh opening for the aforementioned driver. A single cable comes out of the back of the subwoofer, measuring over 2m in length. This connects the subwoofer to the soundbar, which is the only connection required for this component. At the right side of the Creative Stage soundbar, we have three buttons and a USB input. These buttons are the Power, Volume Up, and Volume Down buttons. However, the power button also doubles as an input changer when the soundbar is on, as it cycles between the different inputs on single presses. A long press of this power button will turn off the Creative Stage. As for the USB input, this is meant for you to plug a USB flash drive into the soundbar and the Stage will automatically start playing music directly from the drive. Unfortunately, you cannot use these as USB speakers to your PC. From the back, you can see all of the inputs for the Creative Stage. There are a total of three physical outputs on the Stage. The first is the expected auxiliary 3.5mm jack, followed by an optical connection and an HDMI audio return channel, or ARC, connection. As this soundbar can be used with a computer or a television, it is nice to see an HDMI input. The subwoofer connection port is found further to the left side. This output is not a standard plug, which means you won't be swapping out your subwoofer anytime soon. A fixed power cable is connected at the back that measures approximately 1m in length. I actually think this cable might be too short for some users, but thankfully this did not affect me. Finally, you can see there are mounting holes on both sides of the soundbar. A mounting kit is provided by Creative to let you mount the soundbar onto the wall, if you so desire. On the wireless side, its Bluetooth 2.1 operation depends on an internal antenna. Pairing can be done by using the pair button on the remote. Once a device is paired, you can switch the input to be Bluetooth. The only protocol supported on the Creative Stage is SBC or Subband Coding. This is the default Bluetooth audio codec with reasonably good audio quality and low processing power requirements. Unfortunately, we do not have any support for other codecs such as Advanced Audio Coding or aptX. As this is a powered soundbar, this means the Creative Stage comes with an internal amplifier located inside the soundbar. Each tweeter provides 20W of power, plus another 40W of power from the subwoofer. Together, the specifications say this system can deliver a total peak power of 160W. Power is supplied by a 100 to 240V internal power supply. 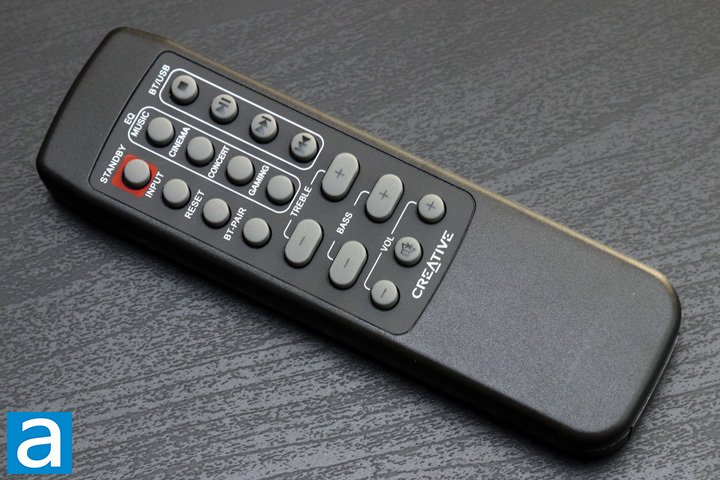 As this is meant to be used either with a television or a computer, Creative has provided a remote control to go with the Stage. The remote is made out of plastic and powered by two AAA batteries, which are not included. Most of these buttons should be self-explanatory, but I will highlight a few. On the left side, the Reset button resets all settings you may have changed, including the current volume. The middle column of buttons at the top lets you choose between four different EQ presets. The right side column of buttons adds media controls if you are playing from a Bluetooth source or a USB flash drive. Finally, at the bottom, you can change the different levels of treble or bass, or the overall volume. The remote control is nothing to really write home about, but it is really nice to still see this provided with the Creative Stage so that you can take control of it from a distance.